Blitzen is a marketing automation app for small businesses. It enables users to measure the effectiveness of their marketing campaigns, profile and segment their customers, and integrate with third-party systems. In this article, we cover Blitzen reviews and pricing. Ready to get started? Get a free trial. As of the date this article was written (March 15, 2019), there are only a few up-to-date Blitzen reviews. Some users said that it is easy to use, set up, and customize. Others love its workflow automation feature. They also commended the customer support team for being able to handle their concerns well. One user who gave Blitzen a positive review on Software Advice said that it is easy to set up and that it is offered at a very fair price. He cited its workflow automation as its best part, explaining that this feature allows for convenient follow-ups with their clients. He also liked how the support team walked him through the process of using the software for his business’ advantage. There are very few up-to-date negative Blitzen reviews online as of this writing. Some users wished though for more customization options for its workflow automation feature. If you are a past or current Blitzen customer, leave a review to help other business owners who are deciding whether or not to use the software. Blitzen pricing is based on two paid plans: Base ($28 to $2,750/month) and Pro ($54 to $3,850/month). The main differences between the plans include the numbers of users and integrations, as well as access to premium features such as behavioral tracking, custom webhooks, and phone support. The exact price for each plan depends on the number of contacts a user needs. Those who need more than 500,000 contacts may get in touch with Blitzen’s sales team for a customized plan. 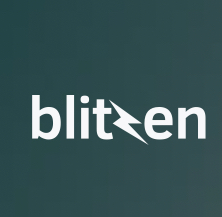 Ready to get started with Blitzen? Get a free trial. 6 Best Marketing Software: Marketing software is used to create and send targeted email campaigns to your customers. We compared the best email marketing software and identified the top six for your business. We evaluated price, list capabilities and segmentation, ease-of-use, analytics and reporting, app integration, customer service, and additional features and identified the best software overall. Can I change, upgrade or downgrade my plan? Yes. To upgrade your account, just log in to Blitzen and go to the “Settings” section and then click on the “Billing” tab. From there, you can select the option to upgrade your plan. If you’d like to downgrade, please contact Blitzen’s sales team directly via email. Do I need to know how to code to use Blitzen? No coding skills are required to use Blitzen. The software allows you to quickly build and embed forms as well as integrate your tools with just drag-and-drop or copy-and-paste options. Have you read these Blitzen reviews and are still not sure if it’s the right fit for you? Read our reviews of all top marketing software providers or check out one of these Blitzen competitors.